ANATOMY OF A BOX INFOGRAPHIC: There’s Nothing Boring About Boxes! ColumbiaMoversNewsNewsANATOMY OF A BOX INFOGRAPHIC: There’s Definitely Nothing Boring About Boxes! 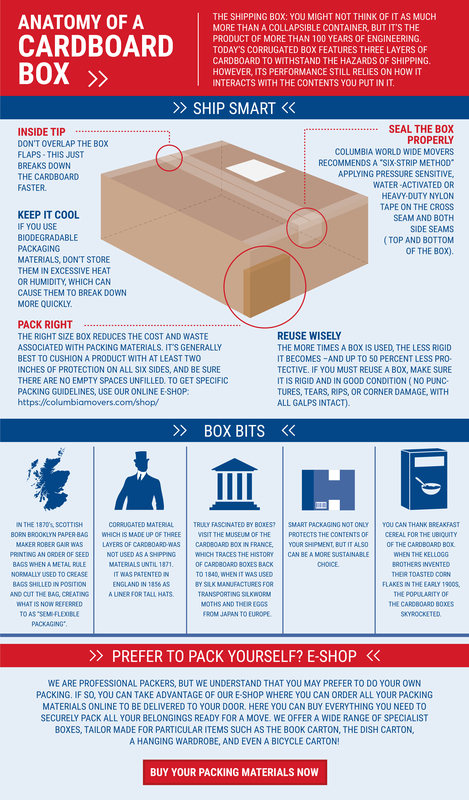 ANATOMY OF A BOX INFOGRAPHIC: There’s Definitely Nothing Boring About Boxes! Check out our infographic and learn more about boxes, and discover for yourself just why we think boxes are certainly not boring! The humble cardboard box, so frequently used yet so often overlooked. No one gets excited about boxes do they? Well actually, here at Columbia Worldwide Movers, we love boxes. In fact we like to think of ourselves as box experts! From their invention over a hundred years ago, boxes have been fine tuned to become the perfect vehicle for storing and moving your precious possessions. Of course not all boxes are made equal, and not every box is suitable for every job. But when you order your packing boxes from us, or entrust us to pack your possessions for you, you can rest assured that we’ll put our years of box knowledge and expertise to good use, to make sure you have the perfect box for absolutely anything you care to pack. We have specialist boxes for everything, from clothes to book and even bicycles.